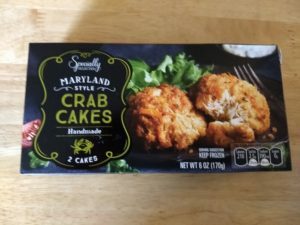 Aldi has some pretty tasty seafood options ranging from crab legs to shrimp to these Special Buy (ALDI Find) crab cakes. The Specially Selected Crab Cakes come in two varieties: Boardwalk Style or Maryland Style. We’ll take a look at both. Both types of crab cakes are handmade and come two to a box, with one crab cake counting as one serving. I tend to prefer crab cakes that contain a lot of crab, with little in the way of fillers like a ton of bread crumbs or celery (I will not buy crab cakes that have celery). These crab cakes fit the bill. While they do contain bread crumbs, they are fairly far down on the ingredients list, with crab meat being the primary ingredient. The crab cakes can be pan sauteed or baked. First, you must thaw them either in the refrigerator for 8-10 hours or in the microwave. To quick thaw in the microwave, place the crab cakes on a microwavable plate. Heat on high for 30 seconds, flip, and heat another 15 seconds. To pan saute (the recommended preparation method), heat 2 tablespoons of oil per cake in a pan for 1 minute over medium-high heat. Carefully add crab cakes to pan, and cook 3 minutes. Flip cakes, reduce heat to medium, and cook an additional 2-3 minutes until golden brown. Crab cakes are done when they reach an internal temperature of 165 degrees. Place crab cakes on paper towels to remove excess oil before serving. These crab cakes are distinguished from the other variety by the inclusion of red and green bell peppers, onions, and green onion. You might consider them the more “grown up” variety of crab cake because they contain veggies. The peppers and onions are not overwhelming, though, and I thought these were quite good; they are perhaps the best of the two types of crab cakes. These are the more pedestrian-but-still-good crab cakes that contain mostly just crab and not peppers and onions like the Boardwalk style crab cakes. These were just as tasty, but their flavor was a little more one-dimensional because they contain just crab and some mild seasonings. 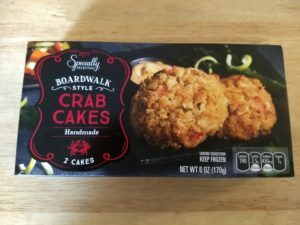 Aldi’s Specially Selected Boardwalk Style or Maryland Style Crab Cakes are both winners. They contain a generous amount of crab and few fillers, cook easily, and taste great. Highly recommended. I have been trying to find the crab cakes at my store in New Albany Indiana and they are out. Is there another option? The crab cakes were ALDI Finds (Special Buys), which means they’re only available for a limited time. They often come back around the same time a year later. I wouldn’t call the Boardwalk style crab cakes “more grown up” just because they have veggies in them. They come out of a different tradition than Maryland crab cakes hence the different preparation. Plus they have a lot more fat in them. I prefer the Maryland style myself, also I believe they are made with premium lump crab meat as opposed to claw meat in the Boardwalk style. I found both of these to be similar to Phillips Brand, which makes great frozen crab cakes in both styles at a much higher price.